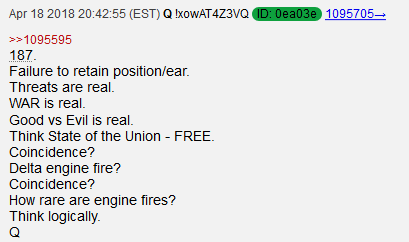 To those who don't understand...There are new Q drops. EDIt...I wondered why the particular post mentioning Alan, 17 plane welcome aboard, had all Q tripcode in bold. My bad, should have mentioned it. The lady who died on Southwest Airlines yesterday was Jenifer Riordan a Wells Fargo Executive. Hmmmm. I'm not making my [V] posts lightly. I do what i have too in the grand scheme of things and i never ever want all this sh!t to come to pass in the first place. Do your thing, it doesn't mean it isn't just wishful thinking. Can you explain that to me? Anybody still watching cnn has a raging case of tds or is in the airport. CNN changing their position on trump will just get those viewers to change the channel to one of 5 others feeding them constant trump hate. CNN hating Trump makes Trump look good because CNN is a pile of garbage and most people know it. If CNN started to become pro-Trump most regular Americans would start viewing Trump with suspicion. She was an unfortunate victim of a random piece of shrapnel. I don't think we can suggest she was a specific target.